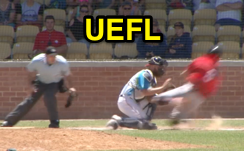 Australian Baseball League Umpire Blake Halligan ejected Heat 2B Luke Hughes for punching an opponent and player-manager Matt Kennelly for arguing Hughes' ejection. With two out and one on (R2), Heat batter Kennelly hit a ground ball to Bite third baseman Jordan McArdle, who threw poorly to first baseman Jordan McArdle, to catcher Bas Nooij as baserunner R2 Derek Peterson attempted to score on McArdle's throwing error. Replays indicate that Nooij tagged Peterson prior to Peterson's touch of home plate, that Peterson's slide potentially violated the home plate collision rule (Rule 6.01(i)(1) Comment: "A slide shall be deemed appropriate, in the case of a feet first slide, if the runner’s buttocks and legs should hit the ground before contact with the catcher"; Peterson's knee appeared to make contact with Nooij's upper thigh prior to Peterson's buttocks and legs touching the ground), that Nooij subsequently shoved Peterson, and that Hughes (who was not involved in the play) ran from the dugout area to deliver a strike upon Nooij's head, the call was irrecusable. At the time of the ejection, the Bite were leading, 2-0. The Bite ultimately won the contest, 2-1. As a result of the misconduct, Hughes received a three-game suspension and undisclosed fine. Wrap/Log: Perth Heat vs. Adelaide Bite (Australian Baseball), 1/15/17 | Video via "Read More"